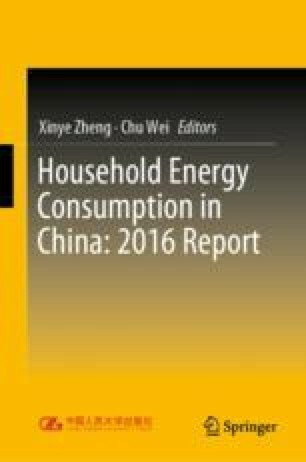 This chapter describes and analyzes the residential energy consumption in China in terms of amount and cost of energy and carbon footprint using energy balance and energy flow charts, and compares the residential energy consumption in different regions of China. The analysis and comparison of residential energy consumption in China aims to identify its patterns and influential factors, help decision-makers and the public understand the basic characteristics and geological distribution of residential energy consumption in China and find out the potential, obstacles and influential factors for energy conservation in daily life. The energy sources for household consumption covered in this survey included coal, gasoline, diesel, kerosene, LPG, pipeline natural gas and coal gas, electricity and heat (steam, hot water and hot air for district heating), firewood, straw, solar energy and biogas, etc. Residential energy-consuming activities included cooking, use of household electrical appliances, space heating, water heating and air conditioning. The coefficients for converting consumption of various energy sources to coal equivalent are from the China Energy Statistical Yearbook. In addition, except for the energy balance, energy flow charts and carbon emission tables, the analysis in other sections is based on the calculation results of electrothermal equivalent.